I'm not a glass is half full kind of guy -- if you've been visiting me here for a while you've figured that out. I know I'm fighting a tide that will overwhelm and consume me. The push for more ethanol, the high commodity prices, the farm subsidies, the nation of lawns... I know we're losing biodiversity at a pace that will mean we wake up one day and a switch has been flipped in our evolutionarily-unique brains: "How'd that happen? Boy, I wish I had something to eat, or at least clean water." Some believe that switch flipping will happen before 2040, when we add another 2 billion humans (see the link in the third paragraph below). I am a firm believer that our home landscapes can radically stall the tide, maybe help us transition into the new world we're creating -- this switch is already being seen in public landscape architecture. Native plants instead of lawn mean insects. Insects mean more plants. More plants mean more mammals and birds and other species. More other species means higher quality of life for humans because the miracle of our environmental diversity to this point has, to some degree, been a spring cushioning this 6th great extinction event now in motion (you can read E.O. Wilson for more on that topic). 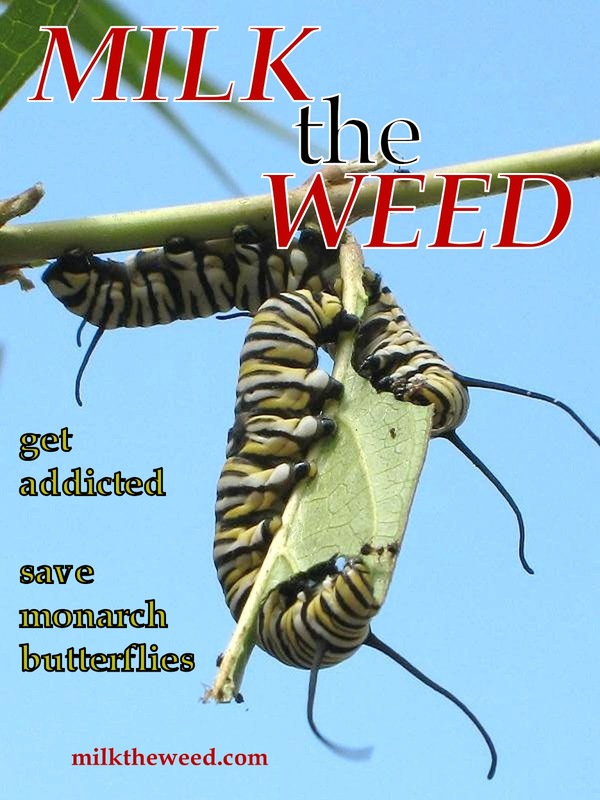 "It is very clear that the monarch population is declining. It's declining very, very rapidly and that decline is statistically significant and it's associated with the loss of milkweed in corn and soybean fields. I'm really concerned about what's happening in the United States because to lose monarch means that we are losing habitats that are shared by a large number of other organisms. To lose monarchs means we are losing a lot of other species and the species we are losing are predominately the ones that are doing the pollinating. ...pollinators keep the system together. They provide transfer of pollen for about 70% of the vegetation out there. If we don't have pollinators, we're going to lose a lot of the plants. If you don't have the plants, you don't have the products that pollination. You don't have fruits, nuts, berries, seeds and foliage everything else feeds on. So, you don't have your small mammals. You don't have your ground-nesting birds and you don't have much of anything. We're already moving into that condition in several states in this country where we really have huge areas where agriculture is so intense that there isn't much in the way of wildlife or pollinators. That's to our peril, I believe." So I started a website and Facebook community called Milk the Weed -- in less than two weeks 250 people on Facebook have pledged to do something. The hope is to get folks planting milkweed native to their area (maps and plant lists are on the website), and once they do this they'll get hooked. The insects that nectar on milkweed, the monarchs that feed on its leaves -- hey, milkweed is a gateway drug to gardening with native plants for wildlife. It sure was for me. I've lived in Nebraska since 2003, but only during the last three springs have my wife and I driven 90 minutes west to a choke point on the Platte River. Here, millions upon millions of birds migrate through each year. The first year it was a cloudy, cold day, and we were just floored by the number, size, and haunting call of the cranes in the corn fields -- these are here, in NEBRASKA? The following year, it was sunny and the cranes seemed restless and sparse. This year we set out in the late afternoon aiming for the time when, just before sunset, tens of thousands flock to the Platte to roost for the night among lost friends and family. On the I-80 exit for Grand Island we found snow geese. People were pulling over off the interstate to see this large group. We stood there in the unseasonable cold (it's snowing today, should be 55), watching the massive flotilla hold tight to the center. After a few minutes I felt shamefully bored. I'd marveled at the geese flying above my house for weeks, headed west toward the Platte migration area. Then suddenly my wife whispers "oh look look look" and a wave of hundreds, thousands rise up in a cacophony of alarm, or as if an itch went through one side of the lake. Up they rose and settled again like a blanket being placed over a bed. Amazing. They did this several times. We drove the back fields for cranes. Their calls surrounded every nook and cranny of the otherwise quiet back country. Some danced, spreading their long wings and lifting a few feet, settling, and lifting again. They've come for hundreds of thousands of years, just as the sun has risen and set. By god I hope they come for a hundred thousand more. Looking at the linear fields, the center pivots, the grain silos, the roads and transmission lines, it doesn't seem possible that this wildness can overtake our stilted creation. This drives some people mad. For others, it lifts them for a moment beyond their self-imposed rules and reminds them that being human is being animal, connected to the earth and not something apart -- and so it is deeply right. We drove for an hour before sunset, trying to find a good place to park, to pinpoint the landing of the first flocks. 20 minutes before sunset and they came from the south -- line after line after line headed for the Platte a mile north. Finally we parked in the middle of a two lane paved road with one eye in the rear view mirror, another to the west where a shadowed tree line seemed to lift off the ground and push north -- a forest of wings. I admit I left feeling unfulfilled. I want to go back. I want to live there. I want to know the world more by knowing the seasons more, like this season of migration. I wanted to see the birds land on the Platte, but they stayed a mile east of the viewing platform (for good reason, as it was filled with cameras). But in the silence of an empty road the sky was literally filled with cranes -- bodies and voices, echoes of echoes as far as the eye could see. As this late snow falls I remember the centering I felt as a kid in Minnesota, alone outside during a storm, everything soundless, distances distorted through the white haze so I only knew the small space where I was in that moment. Sometimes I feel this in my small garden as I pass my arm over an aster or joe pye weed, when hundreds of insects rise up and settle again in the silent focus of their purpose. I pray in nature. I pray when I don't know it. I pray hope and faith that I will not be the only one to know such moments of agony and rapture out here in these rows of corn. I was on the tv last week for the first time ever, talking monarch butterflies. You can see my grey hair below. A lot is going on in my world: gave a talk on butterfly gardening this past weekend, giving one on native wildflowers next. Then it's the Nebraska Book Festival and more events -- including a slew of grading coming up for the English classes I teach. Busy, good work. In the background of all this noise I'm planning a research trip, working on two books, and assuming I have to do some garden cutting down if it ever warms up. A hard life. :) Here's to the thousands of snow geese I've seen passing over my house the last week -- to journeys that begin deep within us and we feel compelled to carry out no matter the physical cost. Today area radar returns showed storms moving north in central Nebraska -- but these are storms of birds, perhaps millions of geese, cranes, ducks, you name it. I am honored to be near this flyway along the Platte River as life cycles thousands of miles north. Every day if I stand outside my back door and wait a few moments, a flock of something flies overhead, sprinting to this meeting ground 90 minutes west of Lincoln. Can you imagine standing under one of these radar returns? Maybe if you can you'll lift off and follow their call. Nebraska Prairie Land Owners -- I Need You! I've posted the below call on all my social media, and the last stop is here. Can you help me? I'm looking for a Nebraska land owner who lives within an hour or two of Lincoln who is fighting to have prairie -- flora and fauna. I need to find someone who's been thwarted in some way by neighbors or officials, someone who believes to the core in prairie ecosystems, and someone who is having trouble along with victories. This implies they know a good deal about how a prairie works and why we need it. Why is prairie important to you? What does it mean? What's your history and experience with prairie? What benefits does prairie have over other landscapes? The acreage size can vary, but can't be miniscule. Know anyone? Message me or email bervogtATgmail.com. 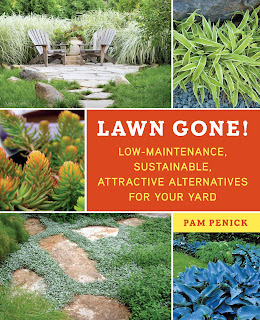 So many of my recent posts have been, well, you know, serious -- so I'm happy to lighten the atmosphere and celebrate the release of Lawn Gone by Pam Penick. I contributed some lawn alternative choices for the northern Great Plains, and I am pleased as punch to be part of a book that advocates more sustainable, cheaper, and just plain exciting examples on lessening our typical lawns. Lawn Gone is full of encouragement and advice -- the section I think is particularly neat is on tips for dealing with neighbors and cities, and converting lawn a bit at a time to ease folks into the transformation. Of course, regional plant picks from around the country are also a good starting point for anyone wanting to get there feet wet with a new kind of gardening that, it seems, is sweeping the country like the harlem shake. You have until midnight on March 10 to enter for 7 great prizes at 7 great blogs. Leave a comment on this post with an email address (no email, no win -- replace @ with AT to avoid spam bots), and I'll use a good ole random number generator to pick one of you to win my prize from Prairie Nursery (see below). Winner must reside in the U.S. and will be announced on this post on March 11 -- unless I'm too busy ripping out my lawn, or my neighbor's lawn. Ready to seed a No Mow lawn? Win a 5-lb. bag of No Mow Lawn seed mix from Prairie Nursery (valued at $35). Prairie Nursery's specially designed blend of fine fescue grasses is an ecological alternative to a traditional, high-energy-input lawn. No Mow grows in sun and shade and also performs well as a footpath or border with moderate traffic. With deep roots, it’s drought tolerant and well suited to regions with temperate to average summers. 1) As a nod to cultivating a moss “lawn” in lieu of grass, Meems at Hoe & Shovel is giving away an adorable Moss Rock in a medium/Cobble size and Toadstool color (valued at $30). Moss Rocks are living sculptures and zen moss gardens all rolled into one. Donated by Moss and Stone Gardens, a design firm in Raleigh, N.C., specializing in moss landscapes. 2) Loree Bohl of Danger Garden is giving away a $50 gift card from Plant Delights, a mail-order nursery that’s a plant lover’s dream. Since 1988, Plant Delights Nursery has been the choice of serious gardeners and plant collectors looking for the best and rarest perennial plants. They have an enticing selection of groundcovers, ornamental grasses, and small perennials, all of which make excellent substitutes for lawn grass. 3) For those in temperate-summer climates, you’ll want to try the 5-lb. bag of Eco-Lawn seed (valued at $55) that Rebecca Sweet is giving away at Gossip in the Garden. 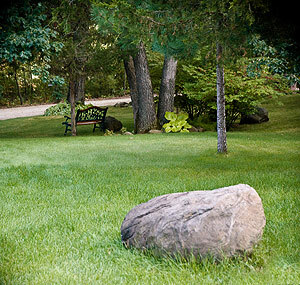 Eco-Lawn, donated by Wildflower Farm in Ontario, Canada, is a beautiful, sustainable turf alternative that consists of fine fescues and rarely needs mowing. This giveaway is available to readers in Canada as well as the U.S.! 5) Genevieve Schmidt at North Coast Gardening is giving away a $50 gift certificate to the charming and tempting online nursery Annie’s Annuals. Annie’s specializes in rare and unusual annual and perennial plants, including cottage garden heirlooms and native wildflowers. They also have a wonderful selection of grasses and succulents, which make great substitutes for lawn. 6) At Digging, Pam Penick is giving away the only patch of lawn you may ever need – a tongue-in-cheek, 13x13-inch “grass” pillow (valued at $60) from Potted, a stylish Los Angeles garden shop and online store. Made from a high-quality synthetic grass, with Sunbrella fabric on the back, these pillows stand up to life out-of-doors beautifully. And doesn’t it look comfortable? Plus you’ll never have to mow this bit of lawn. I believe that gardens are wildlife preserves. Gardens are moral acts of civil disobedience, the same as if we chained ourselves to tractors digging pipelines or tearing down forests or unzipping last vestiges of prairie. Gardens (native perennial and veg) say no to big ag, big oil, and misguided government owned by special interests. Gardens say no to continuing our violent history with this planet and each other. Gardens are freedom and democracy in the truest spirit. Gardens save lives -- human, bee, bird, wasp, fly, spider, frog. Out here in Nebraska you can be tarred and feathered for decrying big agriculture. But agreeing that big agriculture destroys just about everything in the environment means we're then complicit -- that the glory days we're in now will not belong to our progeny as we use up everything good; this is a lot to swallow. I don't believe in slowly winning over people, I'm just too impatient and misanthropic. Only through the deliberate work of writing can I order my ranting and raving into something that, perhaps, will slip under the radar and move us back into the world as caretakers and not pillagers. Only through growing prairie plants alongside my writing can I become the language I most want, where words become action then fall away to the glory of butterflies, bees, birds, and some bittersweet taste of hope. For 5.5 years the subtitle of my blog has been "Poetry, Nonfiction, Gardening, Environment -- All in the Prairie." Today, I changed it to "Living and Writing in the Prairie Echo." It's not a big deal, but I think I finally discovered a term that suits the disconnect between corn fields and prairie preservation / the myth that prairie still exists here. Iowa, Minnesota, Illinois, Missouri, Kansas, Oklahoma, Texas, Dakotas -- we all live in the prairie echo, and it's getting harder and harder to make out what the echo is saying.